To arrive at the University, it is best to get directions from Google, Moovit or Waze. Additional arrival instructions to the University are available on the University page. Within the University, the department of mathematics resides in the Deichman building, number 58b (see maps below, click campus map for a more detailed version). 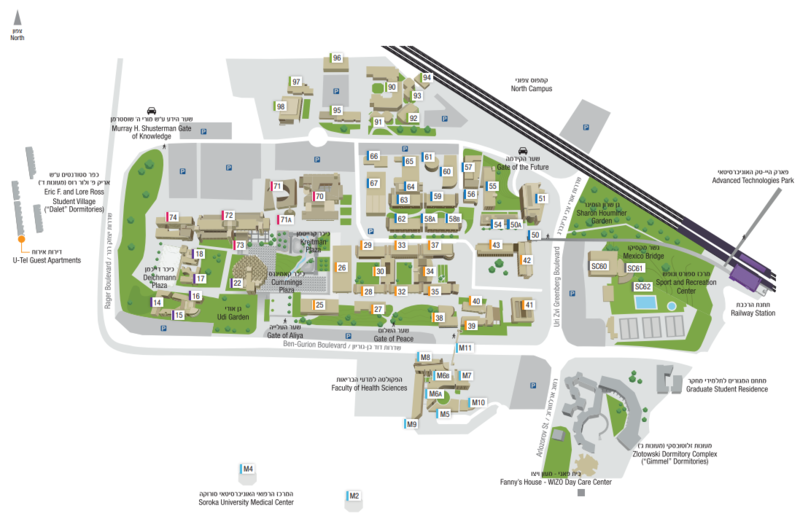 The following map, taken from the MSIH page (which has additional information), shows useful facilities around the campus and elsewhere in Be’er-Sheva (click to enlarge). Additional information is available on the Visitors’ Wiki, and on the University’s visitors page.